As a previous post indicates, LBWF is currently engaged in a major public-private programme to redevelop the borough. Much of the publicity about this programme centres on a few key hubs, principally Walthamstow. Far less is known about what’s happening elsewhere. So to rectify this situation, the following paragraphs focus on an unsung ward, Cann Hall, in the borough’s poorer south. First, some background. Cann Hall is not far from Stratford and the Olympic Park, and to some extent is beginning to share their glamour. Newcomers are flooding in, house prices are going up, and the old solidly working-class character of the area is changing fast. That is the upside, the staple of estate agents’ brochures, but turn the coin over, and the situation is distinctly less rosy. Significant poverty persists. Gang warfare flares and then subsides, in a seemingly endless cycle. Moreover, few of the institutions that once helped cement a sense of place now survive. The police station, adjacent library and nearby Citizens Advice Bureaux offices were all closed in recent years, while LBWF has downsized its Children’s Centre, and, in what must be the meanest blow of all, dispensed with the latter’s associated food bank. So the ward has its challenges. But as has become increasingly clear, LBWF also thinks it has a solution: the production of a plan. The idea of producing a plan for Cann Hall has been kicking around local community groups since the early 2000s, though in those days, despite pressure at public meetings, neither LBWF nor the ward’s councillors took the slightest bit of interest. But after the May 2014 local elections, the councillors dramatically changed tack, and have been enthusiasts ever since. Indeed, nowadays they appear to see possession of a plan as an almost universal cure-all, something that is going to magically transform the area, with one voluble placeman even suggesting, somewhat mysteriously, that it was just what Swiss plutocrats were waiting for in order to jump start an investment spree. So how are things going? 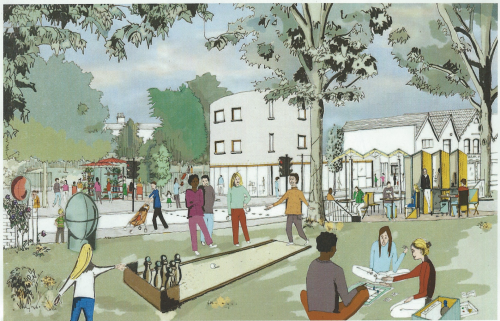 (c) LBWF’s programme of ‘public realm and shop front improvements’ for Cann Hall and its immediate neighbour Cathall. Moreover, though the councillors always refer to planning as if it is proceeding steadily, and the ward will soon reap the benefits, the truth is rather less palatable. ‘Council officers have been reviewing information, data and complementary initiatives that will make the best use of this funding. This is being fed into a brief that the council will use to commission a project to tackle crime and anti-social behaviour hotspots in the ward and improve the appearance and vitality of Cann Hall’. But when a request was then made for hard copies of the cited ‘information, data and complementary initiatives’, the truth emerged, with LBWF admitting: ‘There are no documents relating specifically to this matter’. Turning to the resident-led ‘Neighbourhood Plan’, implementation is only marginally further forward. In mid-2016, LBWF engaged a consultant to ‘help’ the residents in their work, and this led to a ‘community workshop’ a few months later, attended by 40 in one iteration, ‘35 to 30’ in another. However, subsequently, little else has happened. One reason for the hiatus may be that though the workshop yielded 100 suggestions, ‘[t]he main issues gathered from residents were fundamental requirements such as Clean Streets, tackling Fly Tipping &Dog Fouling [sic]’. It is equally possible that the consultant has proved less that stimulating. Certainly, his portentous observation, repeated on several occasions, that ‘Cann Hall ward is unique in that it is placed on the perimeters of 3 Boroughs’ has left many bemused. That leaves the LBWF programme of ‘public realm and shop front improvements’. In an announcement of March 2015, then Portfolio Lead Member for Regeneration and Growth Cllr. Clare Coghill explained that similar interventions had already occurred in other Waltham Forest locations; stated that the budget for Cann Hall and Cathall would be £500,000; and forecast that ‘employment, fear of crime and safety and community cohesions will be positively impacted on as a result of these proposals’. This sounded impressive, but once again the reality has not lived up to the promise. But once again, implementation has been disapointing. Negotiations over the community café are said to be on hold, while LBWF assists the church with its business plan; a mere three property owners have expressed interest in having their shopfronts improved; no pop-ups are in the offing; and the fate of everything else is unknown. All told, this is not a happy story, for several different reasons. First, the link between residents’ preferences and the substance of the planning that has ensued is, as indicated, at best tenuous. Very few local people have been consulted about their wishes, and indeed outcomes seem to have been imposed from a pre-ordained menu, and often with little justification. For example, the area is replete with cafes, so why use public money to create yet another from scratch? Similarly, given that the entrance to the local park was only modernised fairly recently, aren’t the new plans really mere frippery? To make matters worse, there are obvious problems over practicalities. The cinema will generate demand for parking spaces, but it is unclear how this can be met, particularly because some of the adjoining areas are CPZs. Similarly, no provision has been made for upkeep, meaning that, as has occurred several times previously, the newly manicured spaces will likely slide into disrepair, and end up as unloved eyesores. Perhaps most damning of all, with the focus so firmly on ostentation and cosmetics, many of the ward’s most serious and long-standing problems have been entirely overlooked. This is planning without any mention of local scourges like poverty, social housing shortages, relatively low life expectancy, and gang crime – studied myopia that is in itself impressive. As to why the residents of Cann Hall have been taken on this unhelpful detour, the reasons are various, but not hard to discern. Let’s start with the local councillors. None are in the Cabinet, and given that power is so centralised in Waltham Forest, this means that (like all backbenchers) they tend to be largely powerless, confined to the margins. So the difficulty that constantly confronts them is how to reassure residents that they are actually doing something useful. Many issues are too controversial to get involved in. But planning has an egalitarian ring about it, appeals to the demographic that is likely to be active in community affairs, and above all encourages the conceit that, with the help of the Town Hall, a local voice can decisively shape neighbourhood change. So from this perspective, planning is really about electoral politics first and foremost, and it is hardly surprising that it has been pursued with such enthusiasm. For the Labour administration as a whole, planning is also important, though here the word has a rather different connotation. As already indicated, LBWF is currently pursuing a number of large-scale public-private property developments, and these are, by its own lights, squarely aimed at what it calls the ‘rising prosperity category’. Planning is seen as an important component of the whole, but here it is about creating the kind of wider built environment that will be palatable to the new homeowners. Hence the ‘public realm and shop front improvements’ programme in Cann Hall. After all, who other than the better off will want to patronise ‘Cineloo’, play skittles opposite the park entrance, or drink coffee under a glazed extension? The final ingredient in the cocktail is little recognised or discussed. Since recent drastic staff cuts, LBWF has contracted more and more private sector firms to implement policy decisions, consultants of course, but also professionals like architects and property experts. No less than three such outside firms have been involved in Cann Hall planning, and look set to trouser at least 14 per cent of the total spend previously itemised. No doubt all act with integrity, but given that one contract often leads to another, it is likely that in discussions with officials and elected representatives, they naturally highlight the importance of what they are doing, and this in turn exerts pressure for its continuation. Over the years, because of its ‘deprived’ status, Cann Hall has suffered visitations from numerous consultants, and played host to just about every national and local government ameliorative initiative possible. Few if any have made much difference to locals’ lives. And it’s odds on that the fad for planning, too, will fade and disappear. What irks is that no lessons are learnt. But then again, as this blog has demonstrated in laborious detail, that is LBWF all over.